Above: 'The hardy ploughman cheers his team.' Postcard sent from Ashburton to R Underhill at Chagford, 1906. In 1830 Thomas Symons of Halsworthy, Staverton, published an apology to Thomas Hext, a yeoman of Ashburton. He had 'maliciously, unjustly and without foundation' said that Mr Hext had detained a steer bullock belonging to him; he now wished to show his 'sorrow and contrition', and thanked Thomas Hext for agreeing to cease legal proceedings. This is presumably the Thomas Hext below, who may or may not have been at Chuleigh at the time. In April 1833 Thomas Hext, a bachelor, married widow Charlotte Hern by licence. T Hext, Chuleigh, was letting 'a convenient house' in Ashburton in 1836. It had two parlours and two kitchens, five bedrooms, use of a wash-house and an attic. A coach-house, stable and garden 'well-supplied' with fruit trees was available if required. Mrs C Hext, was offering board and lodgings at Chuley in March 1841. The advertisement stated that the house was newly erected. 1843 Mrs C Hext was letting a sitting room plus one or two bedrooms at Chuleigh Farm. 'Terms moderate'. Thomas Hext, a farmer aged 59, is with his brother Richard at Lower Hele in 1851. Both brothers were born in Ashburton. Mr John Hern, of Chuley Farm, was letting a tanyard in 1854. Horsey Hill and Tozer's Ground were for sale in June 1814. 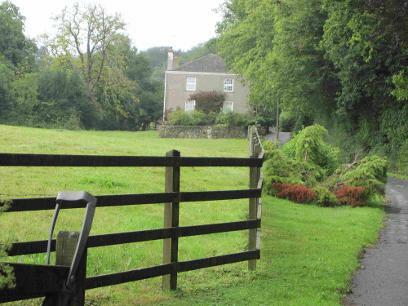 A good farmhouse was set in 140 acres of mixed pasture, meadow and arable ground, plus 20 acres of coppice. A fenced off area contained 'young and thriving timber'. The River Dart was on a western boundary, and the whole was a short distance from Holne Chace and Spitchwick. Mr Penny at Horsey Hill could be contacted for viewing. The freehold of Higher and Lower Bowdley, which Mr Richard Hellier occupied as one farm, was for sale in 1815. The premises included a farmhouse, pound-house*, ash-house**, barns, linhays, cow-houses etc., and about 153 acres of land. 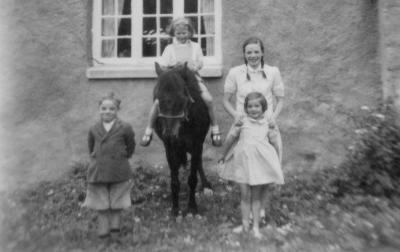 The farm was 'in the best sporting part' of Devon, and had extensive views. There was a lime kiln with lime rocks nearby, and there was the possibility of copper and tin on the estate. ** A building for depositing the ash from fires, (1) for safety, and (2) to store it until it was used on the land. 1831 Daniel West of Ashburton, farmer, was discharged from the Insolvent Debtors' Court. In 1839 the 'Dolbeer Estate' was to be let by tender, after the death of the proprietor, William Hooper. The estate consisted of an 'excellent' farmhouse and outbuildings, set in about 35 acres of orchard, meadow, pasture land and arable land. The position of the property was contiguous with the Ashburton-Exeter turnpike road. Interested persons were to contact Mr Solomon Tozer or Mr Stephen Upton Yolland. William Hooper had died on December 28th the previous year. Aged 70 at the time of his death, he had farmed several estates in Ashburton over a period of nearly 50 years. By March, 1842, Stephen Yolland of Mead had died. Anyone with a claim on the estate had to contact Mrs Yolland of Mead, Mr Rolstone Whiteway, or Mr Roger Hannaford, the executors in trust. According to Stephen Woods, Samuel Hannaford (Roger's brother) had inherited Mead on the death of his father in 1833. Lower Mead was for sale by June, with the premises consisting of a farmhouse, outbuildings and 56 acres. A lime kiln and lime rock, on the road from Ashburton to Mead, was also for sale. According to the advertisement Mr Stephen Yolland had occupied the farm for many years. A year later the wife of Roger Hannaford, yeoman, gave birth to a son at Higher Mead. In the following year, 1844, a large sale of animals and equipment was about to be held at Higher Mead Farm. Sheep, bullocks, horses and pigs were for sale, together with hay and straw. Also for sale were carts, a winnowing machine, harness, a stone roller and various other items. Stephen Woods says that Roger Hannaford emigrated to America - the sale was without reserve, and this may have been the reason. In 1843 a compromise was reached with farmers who objected to lighting the town lamps with gas. Additional lamps were now to be put up. 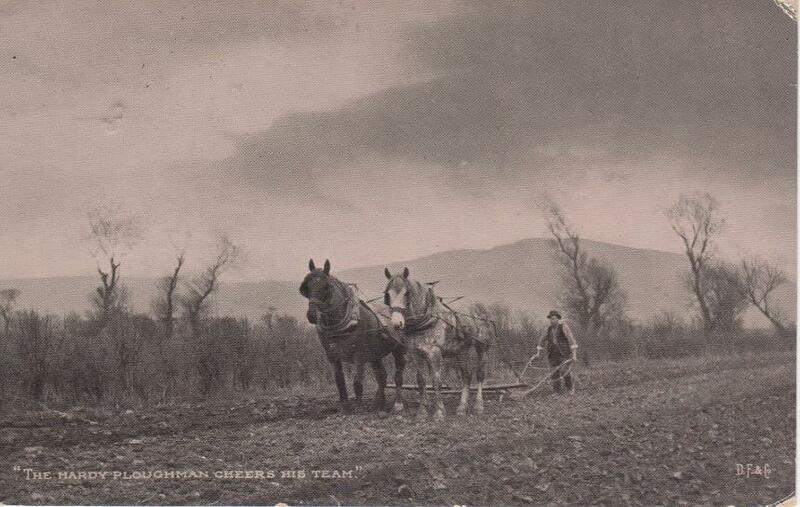 In 1845 there was an excellent harvest of wheat, barley and oats after a run of 'brilliant' weather. The Western Times suggested that those farmers complaining of inadequate crops were about to form a Grumblers' Society. 1847 A barn at Summerhill Farm, owned by Mr. J. Sawdye, caught on fire during a severe thunderstorm. The powerful 'electric fluid' had struck the end door of the barn about midnight. When Eliza Pearse died at Pitt Farm in 1848 aged 30, she left behind a husband, Robert, and six young children. 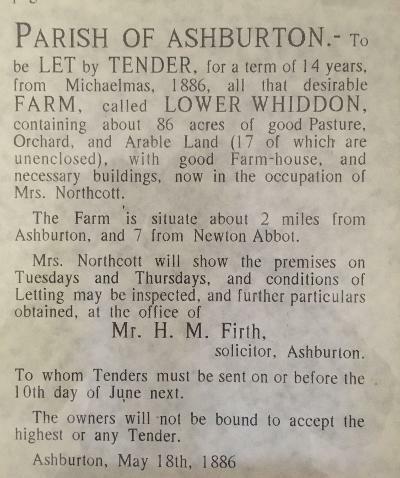 Alston Farm was to be let from Lady-day 1851. Currently in the occupation of Mr Wm Northcott, it comprised 235 acres of orchard, pasture, meadow and arable land. A 'genteel residence', and a farm house, formed part of the estate. Abundant lime was within a quarter of a mile of the property. The hay harvest in 1856 was set to be the finest ever known, in both quality and quantity. The corn fields were 'luxuriant', and the potatoes 'promising'. The apple crop was the only exception to a highly promising outcome. 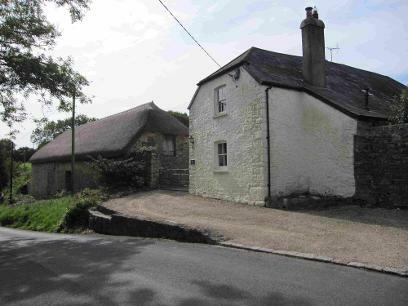 Richard Cooker - No address given, but Lemonford Mill the next property on the schedule. Thomas Easterbrook - No address, but 1 Violet Cottages next on schedule. Samuel Easterbrook - Belford Mill. Brother-in-law to head of house, and may not be permanent resident. William Kentshole - No address given, but properties either side on schedule in Heavyhead Lane. Lodger. Thomas A. Lambshead - Alston. Brother-in-law to head of house, and may not be permanent resident. John Langler - Rew Farm, son of John above. William Northcott - East Street. 'Farmer's son.' Son of Robert above. 'Devonshire. The change of tenancy takes place either at Lady-day or at Michaelmas. In some instances it is at Christmas, but these are rare. There are very few agricultural customs in this county. Nearly all the farms are held under lease or agreement, and any question that may arise is regulated thereby. If there is no lease or agreement the outgoing tenant may in most instances sell everything off. When there are tenancies at will, from year to year, they are determinable by a notice, which may be given by either party six months previous to the termination of any year of the tenancy. An auction is usually held, and everything is sold off, including the manure. A tenant who goes out at Lady-day does not sow the wheatcrop, except by agreement. The landlord repairs the walls and slated roofs, in some instances also the doors and floors; the tenant has to do all other repairs. 1869 Elizabeth Shillabear and her son William were charged with stealing 200 turnip-tops from Mr. George Gidley of Headborough Farm. In court PC Oxenham produced turnips from the field, and it was shown that a top fitted one of them. Mr. Gidley was unwell, and unable to attend to identify the turnip-tops. The defendants were discharged. Later the same year George Rowland, son of George Rowland of Headborough Farm, was seriously injured when his loaded gun came apart, exploded, and shattered his right foot. Dr. Gervis was in attendance. Mary Ann Ward, of Priestaford Farm, was up before the petty sessions in 1871 charged with theft. The landlady of the Union Hotel, Newton Abbot, left her nursery open for the wives and daughters of 'respectable people' who were attending the market. 'Prisoner was considered one of this class'. The previous autumn a child's French merino dress and flannel jacket went missing from a drawer in the nursery, and recently one of Mrs Ward's children was seen wearing the dress at a school in St Lawrence Lane; the jacket was found in Mrs Ward's house. Mary Ann's defence was that she had bought the dress at a stall in Newton Market, and several witnesses swore that she had the items before the time of the alleged theft. Nevertheless Mrs Ward was committed to the quarter sessions. In 1876 four girls living at Buckfast were charged with stealing firewood from James Stancombe's field at Furzeleigh Farm. Susan Lewis, Emma Facey, Clara Howe and Augusta Howe were fined 6d each. In 1877 William Kingwill of Westabrook Farm committed suicide by hanging. He was discovered by W. Irish, a neighbouring farmer. At the inquest his wife testified that he had been depressed for some time, and drank a lot of cider, which she believed had an effect on him. The jury returned a verdict of temporary insanity. In his memories of Ashburton in late Victorian days, Professor John Satterly recalled that milk could be bought from the dairies, but it was cheaper to collect it from the farms themselves. 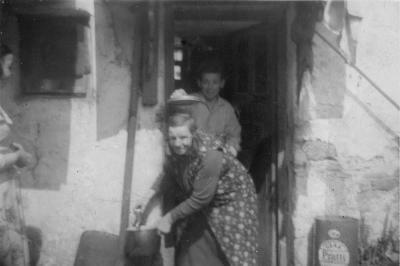 The children took cans either to Westerbrook or Hele farms, for scald-milk or tea-milk. Tea-milk was richer than scald-milk, often containing clotted cream. had 'been inspected by many'. 1894 A series of demonstrations connected to dairy production were about to start in the Market Hall, with the aim of applying more scientific systems to the process. Boys from the agricultural side of the Grammar School were to be involved, and it was hoped to also have a course for dairymaids. By 1897 a Practical School of Agriculture was attached to the Grammar School in Ashburton. J. Smerdon of Lower Mead Farm was the instructor. 1899 Samuel D. Mann, a farmer of Brownshill Farm, sued Alfred Kingwell, late of the Culloden Inn, and George Thorning, 'small farmer' for the cost of a field of barley that he had sold to them. Judgment was given against Kingwell, but it was decided that Thorning had no case to answer. 1902 The two and a half year old son of Mr. Wakeham, of Lower Mead Farm, was killed when a farm boy pointed a gun at him and it went off accidentally. Mr. Wakeham had been using the gun for bird-scaring, and had left it in a cart, covered with hay. 1906 An inquest was resumed into the death of Uriah Cottle of Blackmoor, who had died from a gunshot wound. It appeared to be suicide, but the jury returned an open verdict, accepting the cause of death but unable to say how it had been inflicted. The inquest had had to be adjourned because two sons of the deceased had been intoxicated, and at the Ashburton Police Court both pleaded guilty to being drunk and disorderly. Having been 'severely reprimanded' and fined, they were later certified as wandering lunatics, and taken to the Devon County Asylum. In June 1828 the freehold of Lower Whiddon Farm was being sold by the executors of Solomon Earl. The property consisted of a farmhouse, stable, barn, beast-house and cart-shed amongst other buildings; there was over 92 acres of mixed use land. John Smerdon leased the property. Right: Lower Whiddon was to be let by tender from Michaelmas 1886. Mrs Northcott was currently in occupation. Many thanks to Gerald Vallance for this advertisement. 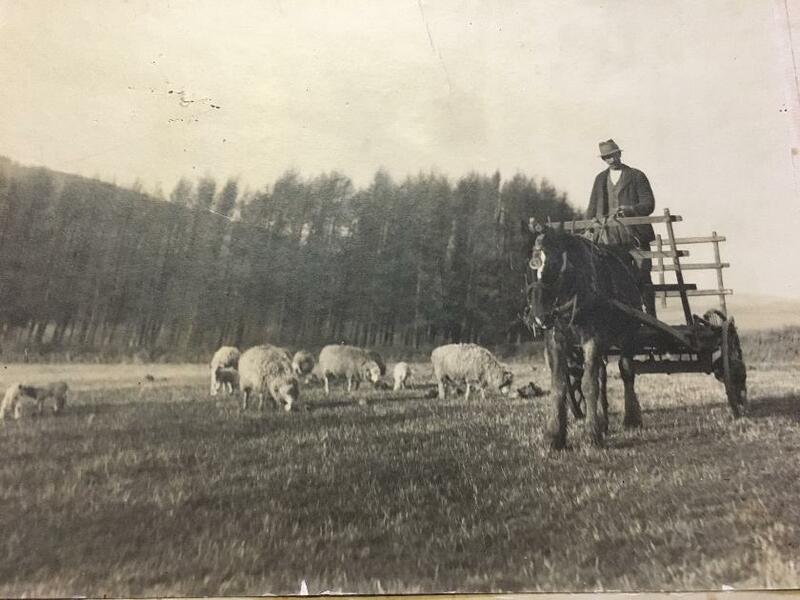 30 year old John Stanbury was a farmer at Lower Whiddon in 1891. With him was his wife Sarah and two year old daughter, also called Sarah. 68 year old James Smerdon was a farmer at Lower Whiddon in the 1901 census. A widower, he had his two sons John and George with him. All three had been born in Woodland. 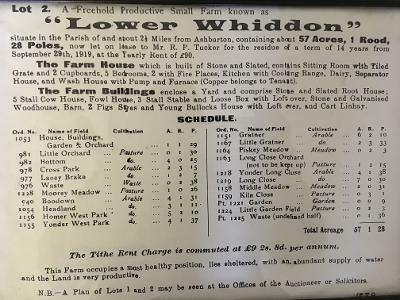 Lower Whiddon, a freehold farm, was being sold by Rendell and Sawdye in August 1907. 'Desirable and productive', it had 89 acres of downland, orchard, pasture and arable land, and minerals such as tin, copper and manganese had been worked on the property. There was a farmhouse and buildings, with J Smerdon the current occupier. The Western Morning News gave a report of the sale the day after the auction, which was held at the London Hotel. Bidding started at £1000, and the farm eventually sold to Mr W Tucker of Dartington, for £1410. Michaelmas 1912. J Smerdon was about to quit Lower Whiddon. Rendell and Sawdye were auctioning 33 acres of oats and wheat, two ricks of hay, four fat pigs, a threshing machine and horse wheel, and dung. Below: Roy Tucker, at Owlacombe Cross. William Tucker was deceased by 1927, and the trustees were selling, amongst other property, Lower Whiddon Farm. Mr R P Tucker was in occupation. The birth of Roy Percy Tucker was registered in the Kingsbridge registration district in the March quarter of 1896. The mother's maiden surname was White. Roy was baptised in the parish of Slapton in June 1898 - his parents were John Crispin Tucker, a farmer, and Alice Maud. Roy P Tucker and his wife Lily P were at Lower Whiddon at the time of the 1939 register. Roy had been born in November 1895. In 1921 Mrs. Smerdon was retiring from business at Summerhill. Rendell and Sawdye were selling various farm crops, animals and implements, including cows, hens and chickens and the apples from 5 acres of orchard. 1926 William Henry Shilston, of Baddaford, pleaded not guilty to driving a motor vehicle to the public danger. He admitted that he was driving a motor milk van at 12 to 14 miles per hour when he emerged from a side road and was hit by another vehicle going at 15 miles per hour. The other driver had sounded his horn 'from the 'danger posts' to the corner at Shinner's Bridge, Dartington. In 1931 Westabrook Farm sold to Mr Tapper for £3000. 1944 (during World War 2) Frederick James Marshall of Lower Meade was fined £5 for refusing to provide accommodation for two children at his farm. He said that three men including himself farmed 153 acres, whilst his wife coped with the poultry, pigs and dairy. Ruslade, near Ashburton, was to be sold in May 1813. A farmhouse, barn, linhay, stables and outhouses were included in the sale; the whole set in approximately 70 acres of mixed arable ground, pasture and meadows. The current occupier was Mr John Irish. 37 year old William Tuckett is at Higher Rushlade in the 1861 census. Widower William Bridgeman, an agricultural labourer, is at Lower Rushlade with his daughter and two sons, of whom 14 year old Jonothon is a farm servant. Higher Rushlade was to have been auctioned on the 30th June 1868, but the property was sold beforehand by private contract. At the time of the 1871 census George Rowe, his wife and daughter were living at Higher Rushlade. He was an agricultural labourer. Henry Irish was at Lower Rushlade, a farmer of 138 acres employing two labourers and three boys. As well as his wife Sophia* and two children, four servants are listed on the census. The youngest, John Layman, is 11. At Ashburton Petty Sessions in 1872, William Snell of Bovey was fined for allowing his pigs to stray onto the highway. Henry Irish of Rushlade was fined 8s plus costs 'for a similar offence'. In December 1881 Henry Irish of Rushlade was summoned for allowing his cattle to stray. In 1883 Henry Irish, farmer, was fined £1 for working a horse in an unfit state. 53 year old Henry Irish of Rushlade was buried on July 9th 1886. John Stanbury, born in Chagford, is farming Rushlade in 1901. A clearance sale was held at Rushlade in March 1905 for Mr J Stanbury. 1908 William Henry Irish, eldest son of the late Henry Irish, formerly of Rushlade, married Miss Florence Paul at All Saints' Church, Kenton. In the 1911 census 57 year old Robert Codd, who was born at South Brent, is a farmer at Rushlade. With him are two grown-up children: Elizabeth, 32, who is a dairy worker ('working on farm' crossed out) and James, 25, who is also working on the farm. When John Codd, butcher and cattle dealer of South Brent, died in 1916, his cousin R Codd of Rushlade was one of the bearers. Robert Cuming Codd died in September 1925 and left estate of £4214 7s 5d gross, £4178 9s 5d net. Probate was granted to his sons James Francis Codd of Rushlade and Victor Cuming Codd of Stoodley, Holne, and to his brother Frederick William Smerdon Codd of Broomborough, Totnes. All were farmers. James F Codd married Sarah A Hamlyn in the December quarter of 1936, in the Newton Abbot registration district. In the 1939 Register James F Codd, born 1886, is a farmer at Rushlade. With him is his wife Sarah H Codd born in 1908 plus two people on whom the records are still officially closed. Meanwhile Elizabeth S Codd, born in 1889*, is living at 2 Avenue Terrace. She is a retired farm housekeeper. * This is presumably Elizabeth Smerdon Codd, the daughter of Robert. Her birthdate varies in records, but her birth was registered in the March quarter of 1875, in the Plympton registration district. 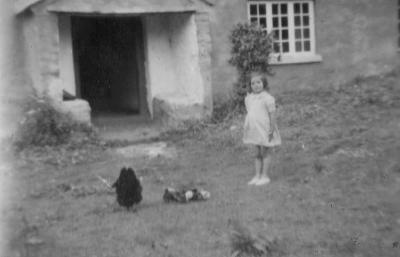 Left: Miss E Codd in the doorway of the original farmhouse, later demolished . A new one farmhouse was built/rebuilt sometime between 1938 and 1967, and the old farmhouse, which possibly had a thatched roof*, left to fall down. The garden in front of the present farmhouse was once an orchard, and the original farmhouse was somewhere on the other side of that orchard. Many thanks to Robert Green for the above photograph and information. *John Satterly talks of the fire brigade attending a thatched barn at Rushlade at the end of the 19th century. 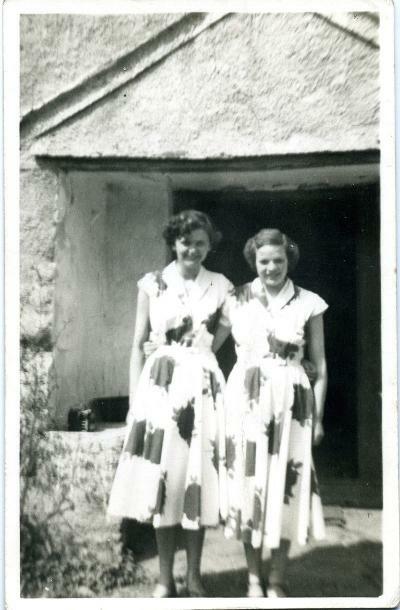 Left: Elizabeth Codd and her sister Kathleen. Above: Elizabeth's brother Stuart is standing on the left. Shire horses Ruby and Damson lived at Rushlade Farm - Elizabeth Codd often talked of them, 'mainly because Damson stood on her foot and broke her toes'. Many thanks to Robert Green for the above photographs and information. Above: Remains of old apple orchard, Druid area. Anthony Simpson, of Ashburton, was assessed for 10 hogsheads, owing £5 6s 8d for single duties, £10 13s 4d for double duty, which appears to be due if the single duties are not paid within a certain time. In the tithe apportionment of circa 1840 William French has a pound house* and orchard at Dolbeare; John Huxham has a pound house and orchard at Alston (William Hellyer is the occupier); and Richard Savery has a pound house and orchard at Goodstone (William Mann is the occupier). A number of other properties have orchards. *Pound house - a building with apparatus for pounding or crushing (usually) apples. In June 1858 a lightning storm burst over Ashburton, one of the most severe for many years. Woodmen returning from Chase Woods took refuge with Mr Wills, a cider dealer at the head of North Street. Wanted immediately, two good workmen - one to work horses on farm, good ploughman, one to work on farm and assist master in care of cattle, steady and industrious. Liberal wages and cider. Apply to Mr Stancombe, Turtleigh Barton, Ashburton. There was a devastating blizzard in the South West in March 1891. 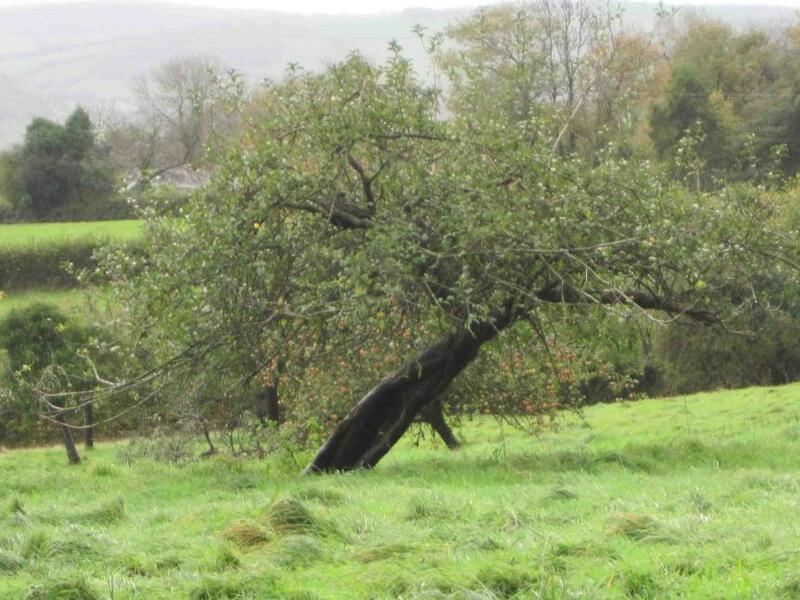 The apple orchards in Ashburton were particularly affected, with some younger trees losing every branch, leaving only stumps. At Ashburton petty sessions John Hayman, 'a lad', was fined 10s for stealing 5 apples and one pear from Mr Hern's ground at Chuley. 'The firing at apple trees on Old Christmas Day, 5th January, was very usual in the neighbourhood of Ashburton during the fifties [ie the 1850s] when I remember the salvoes of firearms from the various orchards on that night...The last occasion in which I took part was on 5th January 1887, when a party of young men proceeded to our orchard and vigorously saluted the trees with volleys from shotted guns, accompanied by cider drinking, shouting the old charm "Here's to thee old apple tree" etc. and the libation of cider at the roots of the best bearing trees. In 1921 Rendell and Sawdye were instructed by the Misses Hern to auction about 60 hogsheads* of cider at Chuley. The cider could be sampled on the morning of the sale.